There are three primary styles of psychic reading, which have a different approach to the energy and momentum. There is no one style that is better than the other, however a client will likely gain more value from one style over the other depending on their personality and needs. Which reading style is best for you? If you want to see the possibilities for your future, you will likely gain more value from an inspirational reader. To understand how underlining energy, and specifically emotional connections are influencing a situation a lot of value can come from a compassionate reader. If you desire to provide little investment into a situation, but still want to know the outcome, the straightforward reader is likely the right choice. A psychic that has an inspirational outlook will likely look more at the positive side of the situation, and the desired outcome. This type of reading is focused more on what is possible rather than the current momentum. This type of reader will likely provide suggestions from Spirit that will help an individual attain their highest good. The most common suggestions with inspirational readings are spiritual in nature or related to underlining emotions influencing situations through the Law of Attraction. A psychic with a compassionate style of reading will likely use their empathic gift to see where the current underlining energy is taking an individual. This type of reading normally consists of an overview of where an individual’s momentum is taking them, and offer suggestions related to the underlining emotion that is influencing the situation. Such emotions are fear, anxiety, love, positive attitude, and so forth. This type of psychic normally has suggestions related specifically to the underlining energy of a situation, but has a neutral perspective when it comes to predictions, rather than focusing on the positive possibilities. 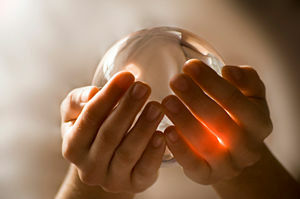 The third style of psychic reading is the straightforward method. This type of psychic approaches a reading with a completely neutral attitude. They look at the current momentum of a situation, but it is very unlikely for this type of psychic to mention remedies or suggestions. This type of psychic often has a very static approach to predictions, however it is important to understand that just because the reading is often very static it does not mean that the predictions are static and unchangeable. Whenever underlining energy shifts with an individual their ability to create and the manifestation that results will shift. Some psychics will use a combination of two styles during a session. The most common styles used are the compassionate and inspirational methods. For more information about how underlining energy and vibration influences a psychic reading, please see my previous blog post entitled Understanding Psychic Readings – The Future.